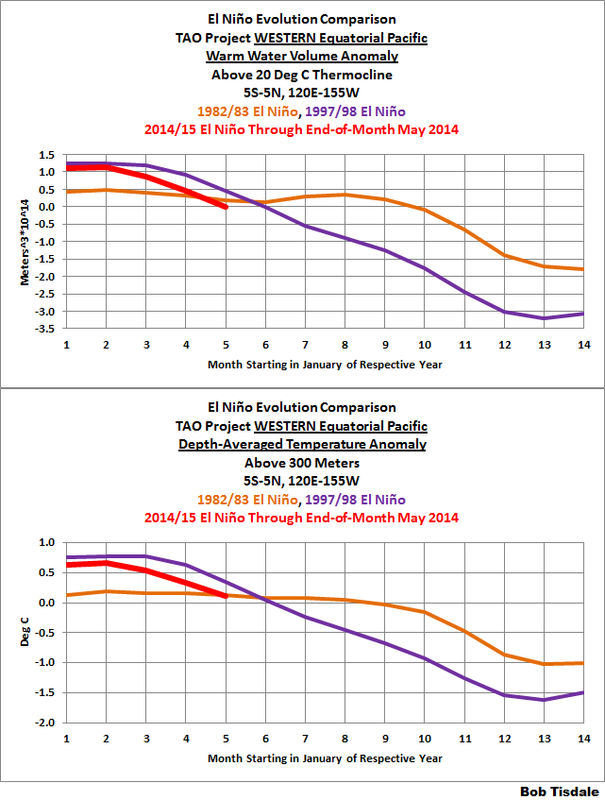 The 2014/15 El Niño – Part 10 – June 2014 Update – Still Waiting for the Feedbacks | Watts Up With That? This post provides an update on the progress of the early evolution of the 2014/15 El Niño with data through the end of May 2014. The post is similar in layout to the May update. The post includes 5 gif animations and 16 illustrations so the post might take a few moments to load on your browser. Please click on the illustrations and animations to enlarge them. 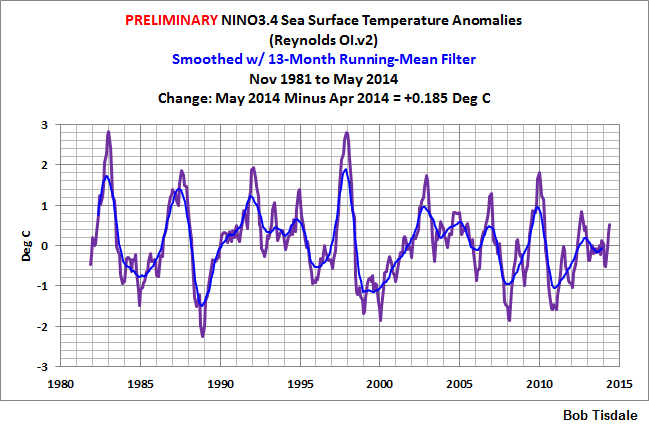 Included are updates of the weekly sea surface temperature anomalies for the four most-often-used NINO regions. Also included are updates of the GODAS map-based animations of sea surface height anomalies, T300 anomalies (depth-averaged temperature anomalies to 300 meters), sea surface temperature anomalies, and the cross sections of temperature anomalies at depth along the equator. I’ve also included two additional animations. The animations start in January 2014 for the full progress of this year’s event. And I’ve added a couple of graphs of the BOM Southern-Oscillation Index (SOI) for this update. 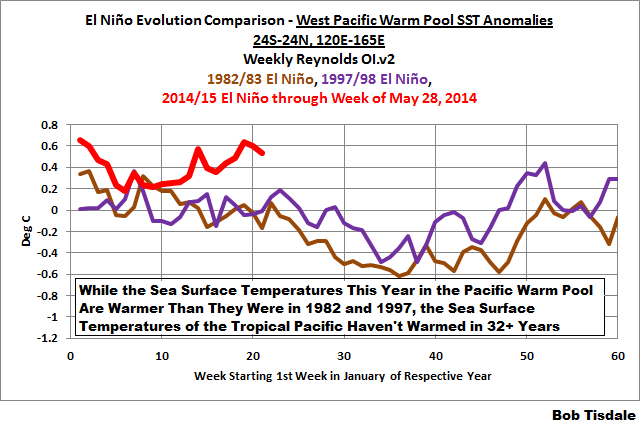 We compared the evolution of the 2014/15 El Niño to the 1982/83 and 1997/98 El Niños in the third post in this series. The evolution of this El Niño is still being hyped by comparing it to the strong 1997/98 El Niño. So I’ve updated those graphs. And since we’ve been watching the downwelling (warm) Kelvin wave as it makes its way east along the equator in the Pacific, also included in this post are evolution comparisons using warm water volume anomalies and depth-averaged temperature anomalies from the NOAA TOA project website. Then, as we did with the May update, we’ll take a look at a number of Hovmoller diagrams comparing the progress so far this year to what happened in 1997. But for this update I’ve also included Hovmoller diagrams comparing 1982 and 1997. All will serve as a background for a general discussion of what should happen next as this El Niño evolves, regardless of how strong this El Niño eventually becomes. As of last week, the sea surface temperature anomalies in all four equatorial NINO regions are elevated—a result of the warmer-than-normal subsurface waters (associated with the Kelvin wave) being upwelled. Using weekly sea surface temperature anomalies for the four NINO regions, Figure 2 updates the comparisons of the evolutions of this El Niño with the 1982/83 and 1997/98 events. As you’ll recall, the NINO3.4 and NINO1+2 comparisons were originally provided in the post 2014/15 El Niño – Part 3 – Early Evolution – Comparison with 1982/83 & 1997/98 El Niño Events. NINO3.4 and NINO3 region sea surface temperature anomalies this year are falling behind the two earlier strong El Niños. And in the NINO1+2 region, the temperature anomalies have broken away sharply from the 1982/83 El Niño evolution, but they continue to be far below the values at this time for 1997/98 El Niño. The NINO1+2 data are an indicator of an East Pacific El Niño, which are stronger than Central Pacific El Niños. In the first post in this series, we discussed a number of animations of maps and animations of equatorial cross sections available from the NOAA Global Ocean Data Assimilation System (GODAS)website. Each cell of the animation is a 5-day (pentadal) average. Those animations ran from January 3rd to March 29th. The following are updates, again starting in January 3rd. GODAS only maintains their animations for 3 months. I’ve stored the maps since the first of the year and will continue to add maps as time progresses. That way we can watch the El Niño unfold from the beginning and then try to keep track of the warm water when El Niño is over. Animation 2 is a similar side-by-side comparison, but on the left are maps of sea surface temperature anomalies and on the right are the H300 maps. I’ve included Animation 4 to put Animation 3 in perspective. The cross sections above in Animation 3 show subsurface temperature anomalies growing quite high as the Kelvin wave moves east. For those who are not familiar with what’s happening there, a look at an animation of the cross sections of the subsurface temperatures (not anomalies) will be helpful. This is provided in Animation 4, which only presents the data for equatorial Pacific. As shown, as the Kelvin wave travels from west to east along the equator, more warm water than normal is carried east by the equatorial undercurrent. This pushes down on the thermocline (the boundary at 20 deg C), causing it to reach deeper than its normal location. As a result, subsurface waters are warmer near the normal location of the thermocline, creating the elevated anomalies shown in Figure 3. Those subsurface waters are now being drawn to the surface through upwelling, causing the sea surface temperatures to rise in turn. The Kelvin wave didn’t create any warm water. It simply caused more warm water than normal to travel from the west (where the subsurface waters are normally warmer) along the equator to the east (where the subsurface waters are normally cooler). Animation 4 was created from the cells of the animations available from NOAA here. Mine is an extended version, starting in January 2014. The Jet Propulsion Laboratory provides maps of sea level residuals on their Latest El Niño/La Niña Watch Data webpage. Animation 5 presents those maps. They provide a slightly different perspective of the impact of the Kelvin wave on the sea levels of the equatorial Pacific. 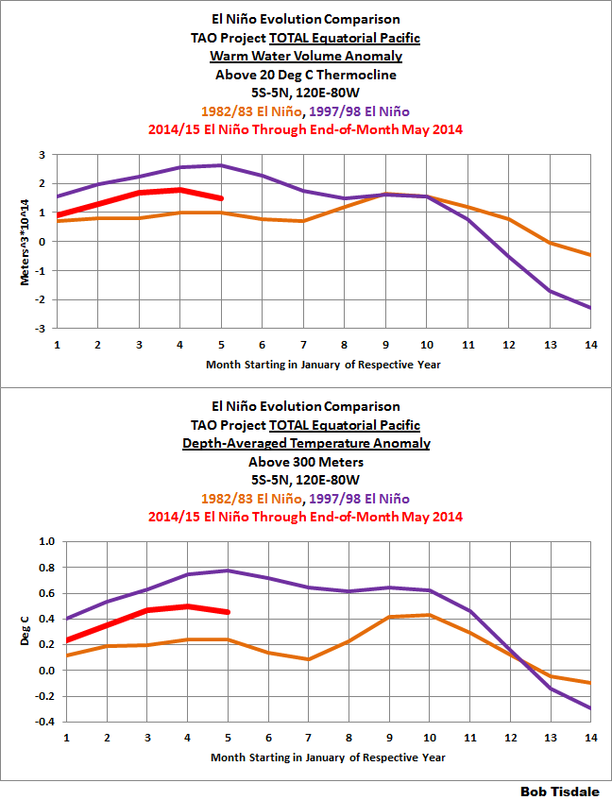 In the following three sets of graphs, we’re comparing data for the evolution of the 2014/15 El Niño so far (through the end of May 2014) with the data for the evolutions of the 1982/83 and 1997/98 El Niños. The Warm Water Volume data are the top graphs and the depth-averaged temperature data are the bottom graphs. As you’ll see, the curves of two datasets are similar. The Southern Oscillation Index is another widely used reference for the strength, frequency and duration of El Niño and La Niña events. We discussed the Southern Oscillation Index in Part 8 of this series. It is derived from the sea level pressures of Tahiti and Darwin, Australia. El Niño events are strong negative values and La Niñas are strong positive values, which is the reverse of what we see with sea surface temperatures. 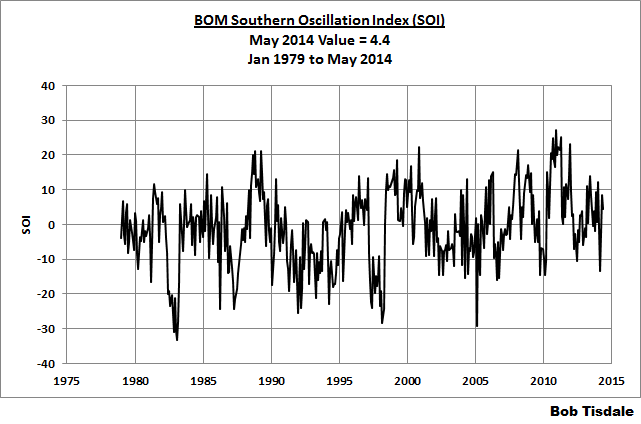 The May 2014 Southern Oscillation Index value is +4.4, which is definitely not an indicator of El Niño conditions. Figure 6 presents a time-series graph of the SOI data. Figure 7 compares the evolution of the SOI values this year to those in 1982 and 1997, the development years of the strong 1982/83 and 1997/98 El Niños. The top graph is the monthly SOI data, and the bottom graph presents the monthly data smoothed with a 3-month filter to reduce some of the weather “noise”. 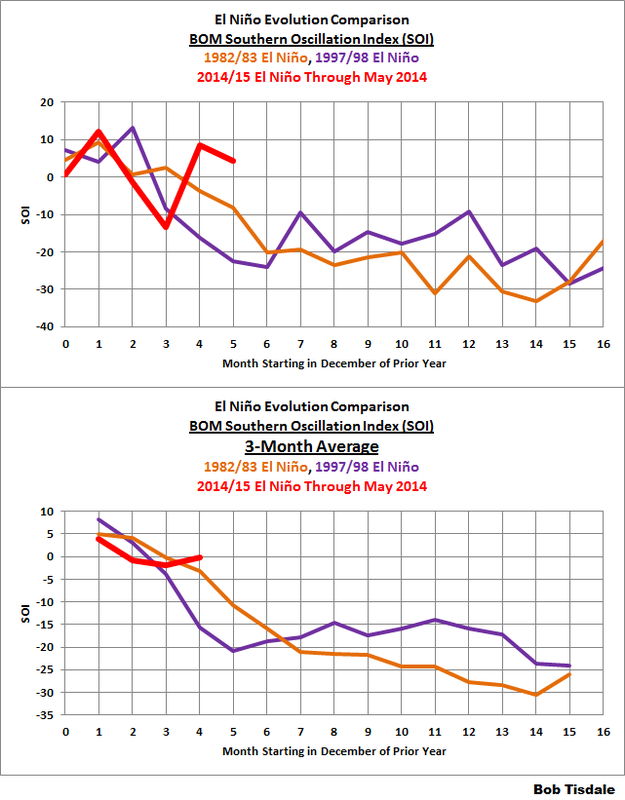 In both cases, the Southern Oscillation Index this year is lagging behind the values in 1982 and 1997. Refer also to the discussion of a video from WeatherBell’s Joe Bastardi later in the post. Hovmoller diagrams are a great way to display data. If they’re new to you, there’s no reason to be intimidated by them. Let’s take a look at Figure 8. It presents the Hovmoller diagrams of thermocline depth anomalies (the depth of the isotherm at 20 deg C) with 2014 on the left and 1997 on the right. GODAS, unfortunately, furnishes the illustrations (not the data) in different dimensions for the two years. The vertical (y) axis in both is time with the Januarys for both years at the top and Decembers at the bottom. The horizontal (x) axis is longitude, so, moving from left to right, we’re going from west to east…with the Indian Ocean in the left-hand portion, the Pacific in the center and the Atlantic in the right-hand portion. We’re interested in the Pacific. The data are color-coded according to the scales below the Hovmollers. Figure 8 is presenting the depth of the 20 deg C isotherm along a band from 2S to 2N. The positive anomalies, working their way eastward since the beginning of 2014, were caused by the downwelling Kelvin wave, which pushes down on the thermocline (the 20 deg C isotherm). You’ll note how the anomalies grew in strength as the Kelvin wave migrated east. That does not mean the Kelvin wave is getting stronger as it traveled east; that simply indicates that the thermocline is normally closer to the surface in the eastern equatorial Pacific than it is in the western portion. The 1997/98 El Niño was preceded by two downwelling Kelvin waves shown in the right-hand Hovmoller in Figure 8. The first one that began in 1996 wasn’t very strong, but the second one that began a few months later in 1997 was enough to start the 1997/98 El Niño. Figure 9 presents the 2014-to-date and 1997 Hovmollers for wind stress (not anomalies) along the equator. The simplest way to explain them is that they’re presenting the impacts of the strengths and directions of the trade winds on the surfaces of the equatorial oceans. In this presentation the effects of the east to west trade winds at various strengths are shown in blues, and the reversals of the trade winds into westerlies are shown in yellows, oranges and reds. Figure 10 presents the Hovmollers of wind stress anomalies…just a different perspective. Note how there were more positive wind stress anomalies in the western equatorial Pacific in 1997 than there have been so far this year. It doesn’t look as though this El Niño will be anywhere near the strength of the one in 1997/98. And Figure 11 presents the Hovmollers of sea surface temperature anomalies. Unfortunately, the Hovmoller of sea surface temperature anomalies is delayed a few weeks…thus the purplish line. But as we’ve seen in the comparison graphs in Figure 2, the sea surface temperature anomalies of the NINO3.4 and NINO3 regions in 2014 are starting to fall behind those of 1997, and the sea surface temperature anomalies this year in the NINO1+2 region are less than they were at this time in 1997. As you’ll note in the Hovmoller for this year, it didn’t take long for the La Niña conditions in the eastern equatorial Pacific to disappear. Some readers are hoping for an El Niño this year to end the drought in their regions. Others are hoping against it, since an El Niño could extend their drought. Because many of the indices this year have fallen behind the 1997/98 El Niño, that does not mean there will not be full-fledged El Niño this year. It also does not mean the El Niño this year will be weak…or strong. It’s still too early to tell. If you were to scroll up to Figure 2, you can see that evolutions of the sea surface temperature anomalies for the NINO3 and NINO3.4 regions started out pretty much the same for the 1982/83 and 1997/98 El Niño events, but then the 1982/83 sea surface temperatures started to lag behind during the months of May through late July, early August—the boreal summer, austral winter. Afterward, the 1982/83 El Niño began to strengthen and eventually grow as strong as the 1997/98 El Niño toward the end of the year in the NINO3.4 region. Figure 12 compares the Hovmoller diagrams of winds stress anomalies for 1997 (left) to those during 1982 (right). We can see that the initial westerly wind bursts in 1997 were stronger than they were in 1982, and that the wind stress anomalies were much stronger starting in May 1997 and lasting through to the end of the year. During that time in 1997, as a result of the additional wind stress anomalies, the Pacific undercurrent (subsurface) and the equatorial counter current (on the surface), should have been transporting much more warm water, compared to 1982, from the western tropical Pacific to the east. As a result, the sea surfaces of the eastern tropical Pacific warmed earlier, and warmed much more in 1997 than they did in 1982. See the Hovmoller comparison of sea surface temperature anomalies in Figure 13. This also appears quite obviously in a comparison of the evolutions of the sea surface temperature anomalies of the entire eastern equatorial Pacific, from the dateline to Ecuador. See Figure 14. We’d never know that the 1997/98 El Niño was much stronger than the 1982/83 El Niño by looking at the most-used sea surface temperature-based ENSO index (NINO3.4 SST anomalies). They show the 1982/83 El Niño was comparable to the 1997/98 El Niño, but it wasn’t. 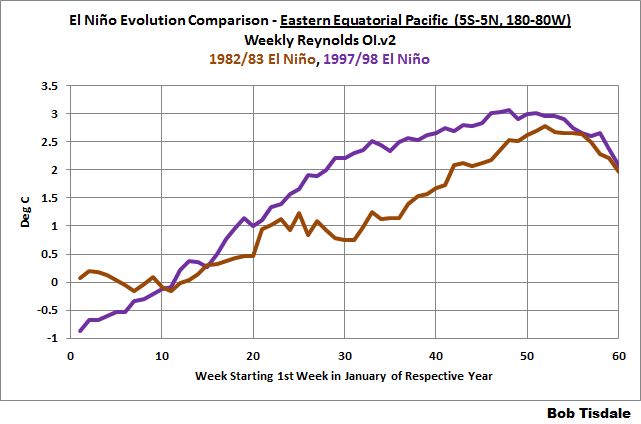 The 1997/98 El Niño was much stronger over the entire eastern equatorial Pacific. Bottom line: there could be a strong El Niño this year, but we won’t know for sure until the boreal summer, austral winter. The trade winds are going to have to weaken. That’s basically the message from IRI’s Tony Barston in his May 2014 Climate Briefing video. And there’s a remote possibility that this El Niño could fail to continue to develop. WHAT’S HOLDING BACK THIS EL NINO? In his Saturday Summary for May 10, 2014 video, Joe Bastardi of WeatherBellAnalystics discussed why this upcoming El Niño will likely not be a strong as the 1997/98 El Niño, and why the Southern Oscillation Index had been positive in April (and continued to remain positive in May). Before I provide a link, there are a couple of things to discuss. 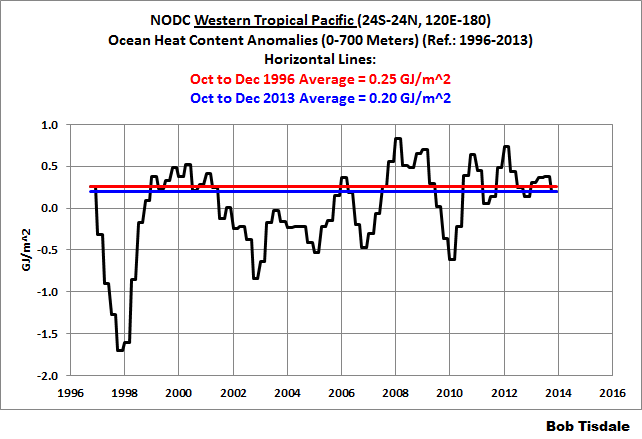 Joe will note that the sea surface temperatures in the West Pacific Warm Pool are warmer now than they were in 1997, and that the warmer sea surface temperatures there are impacting the trade winds. See Figure 15. That might lead some visitors here to think the warming in the West Pacific Warm Pool was caused by manmade greenhouse gases. 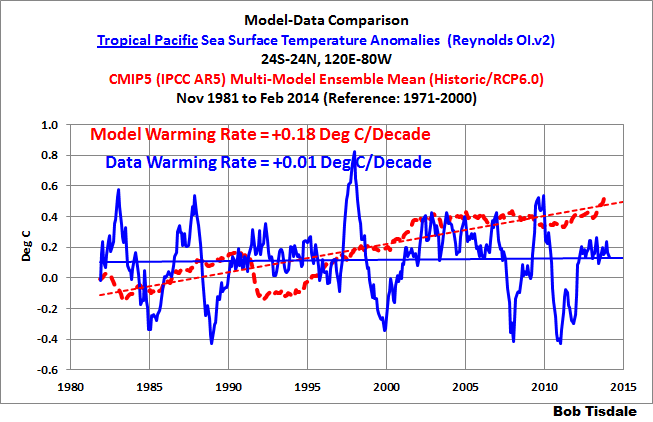 But the sea surface temperature data for the entire tropical Pacific show the surfaces there have not warmed in more than 32 years, Figure 16, while the climate models indicate they should have warmed more than 0.55 deg C in that time, assuming they were warmed by the infrared radiation associated with those manmade greenhouse gases. It’s tough to claim the surface warming in the western tropical Pacific was caused by anthropogenic greenhouse gases when the surface of the tropical Pacific as a whole has not warmed in more than 3 decades. Figure 16 was originally presented in this year’s model-data comparison for sea surface temperatures Maybe the IPCC’s Modelers Should Try to Simulate Earth’s Oceans. 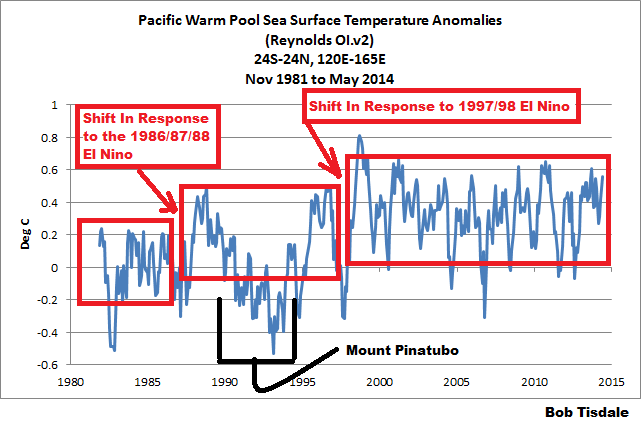 The sea surface temperatures of the West Pacific Warm Pool (see graph here) show that the warming occurred in El Niño-related upward shifts in response to the 1986/87/88 and 1997/98 El Niño events. Those steps are the result of the warm waters discharged from below the surface during those El Niños and the increased strength of the trade winds in response to that warming, with the stronger trade winds providing positive feedback. Thus, while the surface of the western tropical Pacific warmed, the surface of the entire tropical Pacific has not. And as we discussed in the second post in this series, while the ocean heat content in the western tropical Pacific was comparable before the start of the 2014/15 and 1997/98 El Niños, the ocean heat content of the eastern tropical Pacific was much lower before the start of this El Niño. So, while the Kelvin wave may have had a comparable supply of warm subsurface water in the western tropical Pacific to draw from this year, when it arrived in the eastern tropical Pacific, it entered a cooler environment. That also has not helped it. Joe also appears to use the term PDO to mean the multidecadal variations of ENSO in his discussion. To avoid confusion with the PDO Index from the North Pacific, I would have said that the evolutions of El Niño events changed after the Pacific Climate Shift of 1976, and again shifted after the 2006/07 El Niño, which then led to two pairs of double-dip La Niña events, one double-dip before and one double-dip after the 2009/10 El Nino. (The 1998-01 La Niña and the El Niño events of 2002/03 and 2004/05 appear to be aftereffects of the 1997/98 El Niño.) For a further discussion of the PDO, see the 5th post in this series. And without further introduction, here’s a link to Joe Bastardi’s Saturday Summary for May 10, 2014. Joe’s discussion in the video of this year’s El Niño starts about the 3:45 minute mark. Thanks, Joe. WHAT’S NEXT IN THIS SERIES? There are a couple of recent posts by an alarmist and one by a reporter (whose error may have been unintentional) that provide food for a post. RobertScribbler is always full of misinformation. (More examples here and here. I wonder if he’s vying for a job with Joe Romm.) And Nate Cohn’s article in the NYT includes at least one blatant El Niño-related error. I’ll have to read it again to see if there are more. Do you know of any other recent posts or articles with misinformation about the upcoming El Niño? I’d be happy to include them. I started work on a new video about ENSO basics and will try to complete it within the next month or two. Last, my new book is progressing slowly but surely. I’m shooting for a completion date toward September 2014. Almost forgot: NOAA has recently opened an ENSO blog. Since May 5, 2014, they’ve published 6 posts. Their postHow ENSO leads to a cascade of global impacts, authored by Anthony Barnston of IRI, would definitely have provided an additional support link for our discussion in Part 6 of this series. 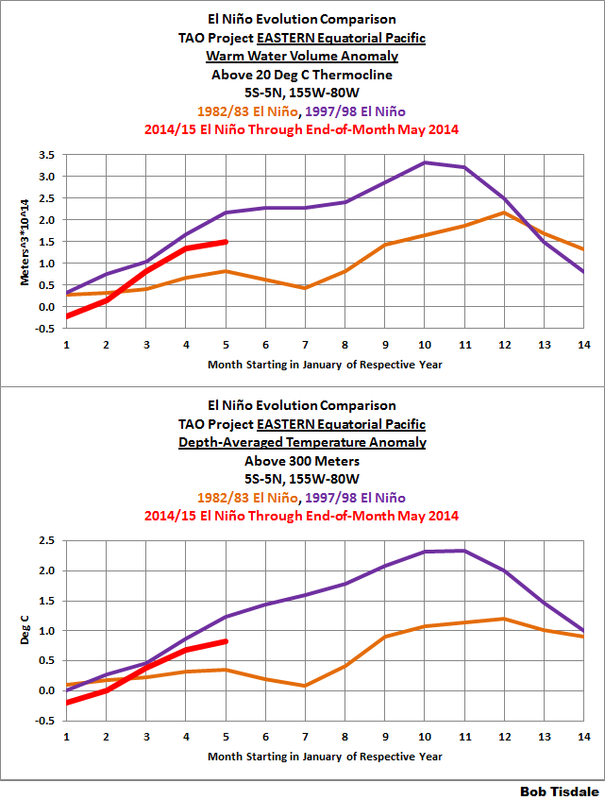 June 4, 2014 in El Nino Basics, ENSO, feedbacks. Thanks Bob. You are a tireless asset. These newest figures for May have torpedoed any sensible talk about strong el ninos. It will be moderate at worst, likely weak and possibly (though not likely) no el nino at all. Maybe Kevin was referring to volcanoes on the sun? The PDO and MEI are linked closely. In other words, you will see the PDO and MEI warm together much of the time and cold together also. There are differences between the two, its just that, for instance, we notice the MEI going positive now and so is the PDO. The reason is simple, both of them rely on conditions in the tropical Pacific for their derivation to some degree, so if the tropical pacific is warming or cooling both of them are going to respond. Here an example, the El Nino of 1957-1958. The PDO in Jan 1957 was MINUS 1.82. June is skyrocketed to plus 1.76 and was still plus 1.5 in October before falling off. The mark of the cold PDO/MEI ( when the MEI is predominately cold too, as it is when the PDO is cold is a rapid run up then flattening) The most recent enso event, 09/10 had a PDO of -1.4 in Jan of 2009, it reached plus .83 in Jan 10. So the PDO spikes too! The latest April Value was plus 1.13 indicating we are already seeing the PDO contribution maturing.. and yet no response from the SOI . IN 1997 THE PDO REACHED 2.79 but at the height of the 83 ENSO event is was over 3.5! Now lets get back to the MEI. Jan 1957 it was MINUS .948 BY MAY IT WAS plus .908 , peaking at plus 1.474 in Jan of 1958! So you in any enso event beyond something weak, the MEI and PDO are going to spike. So its not that I dont mean one when I mean the other, I am simply speaking of two cousins in the family that are indicative of what is going on. But because of what is used to calculate them, there are both going to be close in their trends. The biggest problem here is the ATMOSPHERE is not responding in the way that can allow this to develop to its fullest capacity. The warm water around se asia means lower pressures. Lower pressures do not allow the type of slackening of the trades that higher pressures would. That means the warm water can not mature at the top. In addition the MEI chart shows it all.. when there are el ninos after prolonged cold events of the MEI, or the PDO, the enso events are the modikie 3.4 warmer than 1.2 in maturity and come and go. From the temperature anomaly animations, it kind of looks like the intensity of the anomalies have already started to diminish by quite a bit. I’m thinking we won’t get much more push towards El Nino this year. As Cam notes, the animation makes it look like the warmer water coming to the surface ends in about 1 month. Then temps would stop climbing. Is that a reasonable interpretation? Why is everyone except us so convinced this is going to be a super El Nino despite the face every official forecast I’ve see has it peaking at ~1.5 when both 1982 and 1998 peaked at 3? I’m not sure what you’re seeing in the animation. The “evolution” graphs of sea surface temperatures for the equatorial Pacific, and of eastern equatorial Pacific warm water volume and depth-averaged temperature to 300 meters do not show decreases in anomalies. I believe they may be relying on the reports from earlier this year, and they have not caught up with the fact that the researchers have cut back on their predictions. Agreed. The MEI is an ENSO index, and the PDO reflects the impact of ENSO on the spatial pattern of sea surface temperatures in the extratropical North Pacific. Hoping for at least normal rainfall in the 2014 – 2015 water year. It is not too much to ask. 1. Likely a fairly mild El Nino, not like 1998. 2. We won’t have a truly accurate forecast until mid-summer. Bob Tisdale, Much thanks for this information. The graphical detail provided in the above post is very useful and informative. One question: Do you think lunar declination plays an important role in the formation of El Ninos and what might happen next year with the minima? It is watching history in the making, with someone to give us the insights into the events during, instead of after. A fascinating read. Thanks Bob! Hi Jennifer. Sorry, I haven’t studied the subject. Pacific temperature anomalies of +/- 0.5 degrees C over just a few years. Surely that has a lot of effect on overall earth temperature and limits the resolution with which trends can be determined. the global temperature anomalies from May 31 to June 4 were, respectively: 0.67, 0.60, 0.55, 0.49 and 0.47. That is a drop of 0.20 in 5 days. Would this have been due to the volcano? And if so, is this an indication of how this volcano could nullify the warming effect of a potential El Nino? Thanks! Bob, you are eye candy. Having never seen you I have only your graphs to tell me that. And I love your graphs. REPLY: And yet, Bob writes here for free, improving knowledge for the benefit of all. I’m inclined to give him a pass on a book promotion. Werner, historically we really don’t have much in the way of upper atmospheric info on Volcanic distribution of particulate matter to usable resolution that I can find. Nothing pre-sat era is really applicable. Volcanic activity has played a role in climate from day one and is a variable of which we have little usable data. One thing I dont get is how come when the warm water is in the west Pacific this cools the Earths air temps..
And when the same warm water is in the East Pacific it warms the Earth up. Excellent analysis. Congratulations. Please observe the development the southern polar vortex. It has a huge impact on the circulation of the Pacific. Heavy lifting, and Bob has laid it out easy for you. Bob will educate you if you let him. Contrary to appearances, the polar vortex has a large impact on the circulation at the equator. Especially its anomalies. Great article, looks more like an El No-no, but I hope whatever it does is a net benefit to mankind. At the level of 500 hPa can be seen strong circulation of east. I agree–I’m a writer and what Bob does takes a lot effort, time, and knowledge–not to mention skill. I’m delighted that Anthony “pays” for his services by allowing the references to his work. Thanks both Bob and Anthony! I heard a lot of people especially an experts saying a huge Madden Julian Osc (now in progress) will enter west pacific by mid june and that would give a green light for the onset of el nino…..is that true ? Werner Brozek, I don’t pay enough attention to the reanalysis of daily global temperatures you linked to know whether that 0.4 deg C drop is within the normal range of weather noise. Personally, I had intended to (1) keep an eye on TLS data from RSS and UAH (as a proxy for aerosol optical depth) to see if we can see a spike there over the next few months, and (2) watch the weekly SSTa data, especially for the Pacific Warm Pool, for any large dips. The MJO at that time causes Westerly Wind Bursts in the western tropical Pacific, which enhance the development of the El Nino. But the paper leaves answer the question open as to whether the MJO at that time is simply another normal aspect (feedback) in El Nino evolution. My thanks to you, Anthony and everyone who bought a copy in response to the ad in this post for the support. The warm water in the west is the “normal” condition. During an El Nino, that warm water from the west Pacific Warm Pool floods eastward (much of it coming from below the surface of the west Pacific Warm Pool) and spreads across the surface of the eastern equatorial Pacific. Before the El Nino, most of the warm water was below the surface of the West Pacific Warm Pool (and not included in the surface temperature record), and during the El Nino the warm water has been spread across the SURFACE and is now included in the surface temperature record. 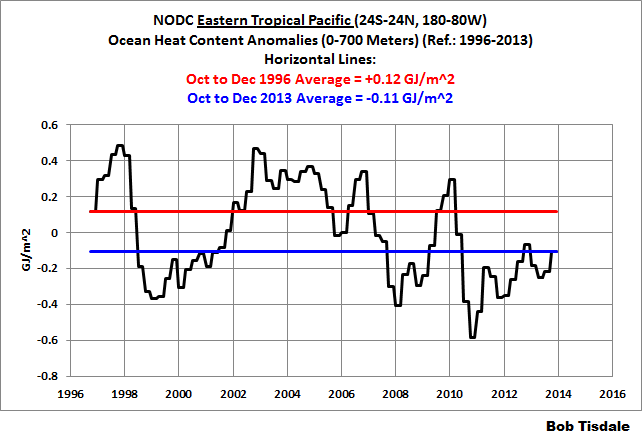 Basically, more warm water than normal is on the surface of the tropical Pacific during an El Nino. A La Nina is an exaggerated “normal” condition, with the warm water flowing to and accumulating in the West Pacific Warm Pool to depth. But the stronger-than-normal trade winds associated with the La Nina, causes additional cool water in the east to be upwelled, so now there is cooler water than normal across the surface of the equatorial Pacific. Streetcred, thanks for the video. I saw them more than 40 years ago in a little hole-in-the-wall nightclub. They were fantastic. Thanks again. Blockade the southern polar vortex on the Indian Ocean in the region of southern Africa delays the appearance of Passat in India. Was the 1997 SE Asia “Super” Haze simply a co-incidence, or is there a connection with the 97-98 El Nino? It was my impression that the haze suppressed local winds over large areas of SE Asia. (perhaps by reducing the difference between night and daytime temps?). We lived in SE Asia for 10 years and never saw a repeat of the Haze anything like 1997. The concentration of sulphur in rain falling over Singapore in 1997 correlated closely with the PM2.5 concentration, which can be attributed to the strong sulphur emission from peat fires. Looking at Wikipedia I see there was another record SE Asia Haze in 2013. Coincidence? The 2013 Southeast Asian haze was notable for causing record high levels of pollution in Singapore and several parts of Malaysia. This el Nino that we’re waiting for – its been given a nice Kelvin wave, but what’s stopping it developing? But sadly, those trade winds just are not playing ball – look a Bob Tisdale’s figure 15. Plus the Kelvin wave itself looks sickly. ren, many thanks for the numerous earth.nullschool.net links. I thoroughly enjoy that website. As I’m sure you’re aware, though, the earth.nullschool.net maps are based on a weather model, which is supported by data but may not be realistic in all respects. And as I’m sure you’re also aware, the relationships you’ve presented are snapshots of weather (which is chaotic) for a specific time and place, and while the relationships may have existed at that specific time, if you were to go back in time a week, a month, a year, that relationship may not exist. Good info Bob. As you have pointed out there are numerous essential criteria for an ENSO cycle to be deemed Neutral/El Nino/La Nina. One of which are trade wind anomalies. While not an anomaly chart The Streamline Analysis would give the readers an idea of the wind direction at the equator. http://www.prh.noaa.gov/hnl/graphics/stream.gif. The lines give the actual wind flow but do not indicate wind speed, regardless of spacing. Thus the chart does not provide either speed nor anomaly but it offers direction which is helpful in visualizing what is actually happening. An active MJO which is often accompanied by equatorial westerlies (the westerly wind bursts) is easily picked up. The chart is useful as well for picking up equatorial waves moving east to west; important during cyclone season. BoM also offer streamline maps. If one is interested in the actual wind speeds and directions the ASCAT Satellite data accomplishes this. This is a low pass satellite and cuts ‘swaths’ north/south of about 300 nautical miles, every day, 24 hours a day. It’s available on the internet as well. While I use ASCAT everyday for my forecasting I do not know how NOAA establishes the trade wind anomaly figure. Nor do I care about anomalies as I need real data. Obtaining real winds across the equatorial region is very very time consuming as the satellites takes many hours in the day to complete their passes across the Pacific. I truly hope NOAA doe not fudge the numbers based on a few passes. Perhaps you know their procedure? Yes and very helpful Thanks Bob. Great work Bob, many thanks. masses due to wind-induced Ekman drift of surface layers away from a coast. tongue, a broader warm area develops. Hope this helps to explain a complex situation. 1sky1, thanks for the feedback and for confirming what has been presented in past posts. Scratch my earlier reply to you. I hadn’t read it thoroughly enough. You appear to be going of topic on me here, 1sky1. In every discussion of Kelvin waves as part of this series, we have been discussing downwelling equatorial Kelvin waves, so I’m not sure why you’re introducing upwelling Kelvin waves to the discussion. …and the normally occurring upwelling there is now “feeding” on cooler subsurface waters. Here’s what happened when I took the ARGO data and tried to find a six month leading indicator of NINO3.4. Between 2005-2012 there was a region just southeast of the Solomon Islands where there was a somewhat decent correlation at 125 meters depth. 0.4 was the R2 stat. Given the methodology it’s got to be spurious, but if your inclined to believe it, then the expected El Nino should turn out to be a La Nina instead. Although I was looking for a six month leading indicator the correlation was highest as an eight month indicator. and, if we had good regular updates, this would be the one good area to focus upon. I use http://www.bom.gov.au/climate/enso/sst_wind_anom_5day.large.gif but it is poor, particularly for quantitative wind speeds. do you think that CURRENT information on the map is incorrect? 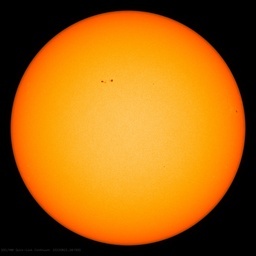 Will appear more interference southern polar vortex due to the significant growth of cosmic rays (low solar activity). Look at the vortex at an altitude of about 30 km. Please pay attention to the temperature anomalies over the equator. May see a distinct anomaly at an altitude of 45 km. This may be a result of the increased ionization only. pulsations in the strengthened west-setting counter-currents that flood the Eastern Pacific. Global Warming Apocalypse is Approaching and Super El NIno is coming very quickly and be ready. Sorry about the delay in returning to this thread. I did not write that. Please read my earlier reply. Those pulsations most assuredly cause more warm water than normal to be carried eastward by the equatorial undercurrent. You might not like my phraseology, but there is nothing wrong with that description.